I recall, at about the age of 9, carving my initials and those of my one true love (hello Timmy Field!) into a tree trunk to ensure history would forever be recorded. Had I known about this fab idea I would have left that poor ole gum tree be and headed off to the local hardware instead. The love lock bridge. Where lovers carve their initials in a padlock, attach it to the bridge, and throw away the key. Have you ever been to a love lock bridge? Do you know of one locally? This one is in Cologne Germany. 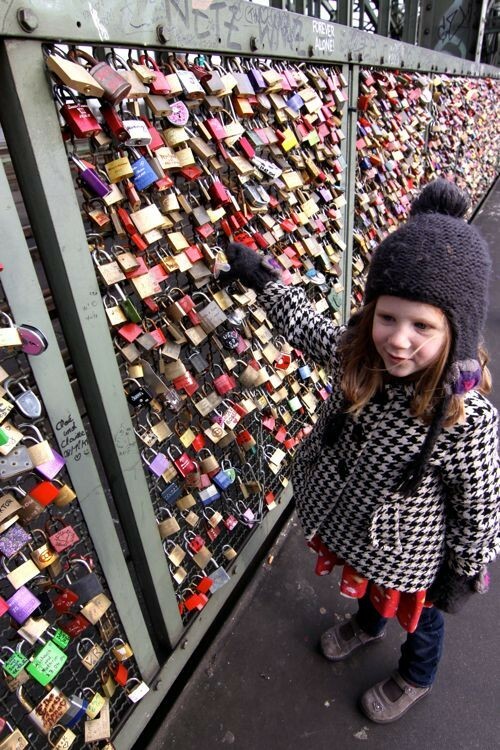 This entry was posted in stuff we just love and tagged love, love lock, young love by rudyandthedodo. Bookmark the permalink. The last time we walked over the Harbour Bridge we noticed locks on there – not a lot but enough to keep the kids walking!!! They are mainly near the northern end.